Situated near the beach, this hotel is 0.6 mi (1 km) from Tanjong Lobang Beach and 1.9 mi (3.1 km) from Imperial Shopping Mall. Marina Beach and Bintang Plaza are also within 3 mi (5 km). 2 restaurants, an outdoor pool, and a fitness center are available at this hotel. Free WiFi in public areas, free self parking, and a free shopping center shuttle are also provided. Additionally, a bar/lounge, a coffee shop/café, and a conference center are onsite. All 167 rooms provide conveniences like refrigerators and coffee makers, plus free WiFi and LCD TVs. Minibars, room service, and free newspapers are among the other amenities available to guests. 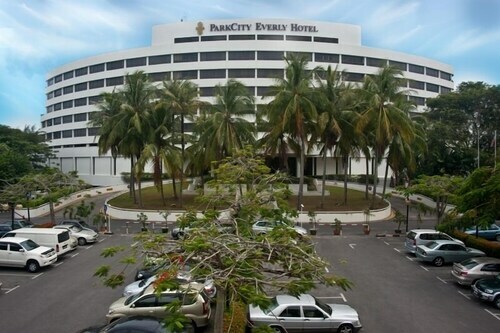 In addition to an outdoor pool, ParkCity Everly Hotel Miri provides a fitness center and a children's pool. Dining is available at one of the hotel's 2 restaurants and guests can grab coffee at the coffee shop/café. A bar/lounge is on site where guests can unwind with a drink. A computer station is located on site and wireless Internet access is complimentary. A business center is on site at this 4-star property. 8 meeting rooms are available. This business-friendly hotel also offers tour/ticket assistance, gift shops/newsstands, and coffee/tea in a common area. Complimentary self parking is available on site. ParkCity Everly Hotel Miri has designated areas for smoking. Melinau Terrace - This poolside restaurant serves breakfast, lunch, and dinner. A children's menu is available. Reservations are required. Long Jin Restaurant - This restaurant serves lunch and dinner. Start your morning with a buffet breakfast, available each day from 6 AM to 10 AM for a surcharge. You can order up room service during limited hours. Rollaway/extra beds are available for MYR 102.17 per night.